His auspicious debut recording is in the company of two of Australia’s finest chamber musicians, pianist Anthony Romaniuk and cellist Michelle Wood. All three relish Ravel’s finest writing for violin, cello and piano, bringing their exuberant and fresh artistry to the celebrated pieces Deux mélodies hébraïques, Pièce en forme de Habañera, Sonata for violin and piano No. 2, Sonata for violin and cello and the title work, Tzigane. Providing outstanding young musicians with the best possible recordings with which to present their talent to the world has been an essential goal of Melba Recordings. Using the latest direct stream digital technology, these world-class performances are presented in the finest SACD sound reproduction. The Ken Cato design and elegant packaging complete this very handsome release. 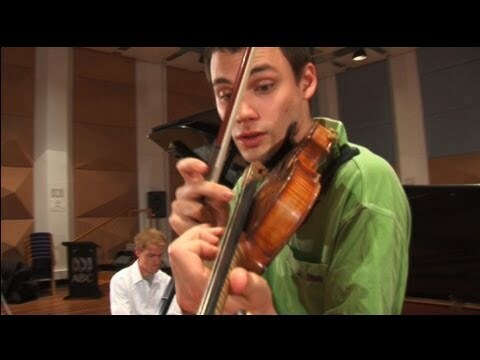 Kristian Winther (violin) and Anthony Romaniuk (piano) perform the second "Blues" movement from Maurice Ravel's Violin Sonata No.2 in G Major. 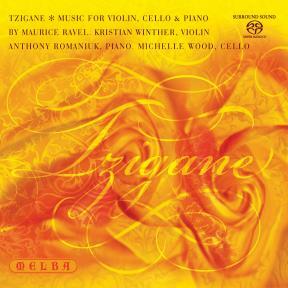 From the Melba Recordings SACD, "Tzigane" (MR 301115). Recorded at the ABC Southbank Studios, Melbourne. Maurice Ravel, the French composer whose eclectic style and sophisticated musical innovations were built on a profound respect for the past, was born in 1875 in the Basque village of Ciboure to a Basque mother and Swiss father. The family moved to Paris soon after Ravel was born, but his parentage and birthplace were to leave their mark on his music, as evidenced by his intuitive and natural feel for Spanish musical idioms. His engineer father was also an enthusiastic amateur pianist, foreshadowing Ravel’s own interest in both music and machines (one of the composer’s hobbies in later life was collecting mechanical toys). During early piano lessons Ravel showed great musical ability and was admitted to the Paris Conservatoire, where his principal teacher was Gabriel Fauré. His stubborn individuality meant that his time there was always going to be less than comfortable; he was expelled first from piano lessons and then from composition class. Ravel’s unwillingness to be hindered by the accepted rules of composition (like avoiding parallel fifths, for example – one of the most fundamental principles in traditional part-writing) also compromised his chances of ever winning the prestigious Prix de Rome, a competition designed to test a musician’s knowledge of, and skill in, his craft. Ravel submitted himself no fewer than five times for the prize but success always eluded him. (It is interesting to note that the similarly iconoclastic Berlioz had previously entered the competition four times before he finally found success.) Failure did not diminish Ravel’s ambition, however, and he remained steadfastly determined to make his own way in the world. The 1889 Paris Exhibition, now chiefly remembered for the building of the Eiffel Tower, featured exhibits from all around the world and fed Ravel’s taste for the exotic, as, indeed, it did Debussy’s. Both composers were especially impressed by the displays of Javanese gamelan music, elements of which were later to appear in their music. In 1902, ever open to extra-musical influences, Ravel became a member of Les Apaches, an avant-garde group of like-minded composers, artists and writers that included fellow composer Manuel de Falla, the conductor Désiré-Emile Inghelbrecht and the pianist Ricardo Viñes. The group would meet once a week to discuss the latest philosophical and aesthetic ideas of the day and Ravel was later to dedicate the separate movements of his piano work Miroirs to some of his fellow Apaches. Despite enjoying the support of influential figures, especially that of his former teacher Fauré, Ravel also had his detractors, not least the prominent critic Pierre Lalo who saw him as a mere imitator of Debussy. But while Ravel readily acknowledged the genius of the older composer, happily paying tribute by making transcriptions and orchestrations of several of Debussy’s works, he consistently rejected the suggestion that Debussy’s music had any influence on his own compositional style. During World War I, Ravel served as a driver in the French army, his poor health precluding him from active combat duty. He saw service not far from the front at Verdun, and the trauma of the experience combined with the sudden death of his mother in 1917 affected him deeply. Despite his growing reputation at home and abroad, his compositional regime was to slow considerably over the next two decades. Following a car accident in 1932, in which Ravel received minor injuries, he began increasingly to suffer from the effects of a degenerative brain disorder. Although undiagnosed, it has been suggested that it was the acutely debilitating Alzheimer’s Disease. One of the more serious aspects of his condition was amusia, a disorder of the brain’s neural network that inhibits the recognition of musical tones and rhythms. Certainly, Ravel was finding it increasingly difficult to write music. On 28 December 1937, 10 days after an unsuccessful craniotomy by the French surgeon Clovis Vincent, Ravel died in Paris. Ravel’s attitude towards composition, first adequately summarised in English by Arbie Orenstein in ‘Maurice Ravel’s Creative Process’ (The Musical Quarterly, October 1967), was one of a continuous striving for technical perfection. Ravel was heavily influenced by the aesthetic approach advocated by the American polymath Edgar Allan Poe as laid out in his 1846 essay The Philosophy of Composition: that the act of composing should proceed in a logical fashion; that it should hold originality forever in its gaze; that the result should be perfect in all its parts. Also attractive to Ravel was Poe’s idea of conceiving an entire work in the imagination before putting pen to paper to write it down. In Ravel’s case, this almost always resulted in a long period of gestation followed by a post-compositional period of polishing and perfecting. The Sonata for Violin and Piano included on this disc could be considered one such instance, given the nearly four years taken to complete it. in his own practice, Ravel also acknowledged that what he most looked for in a musical composition, whether his own or that of another, was evidence of sensitivity and emotion. In instinct and in execution, Ravel was essentially a miniaturist, and even in his larger, orchestral works one can perceive a process that amounts to the incremental aggregation of smaller units that reflects and illustrates Poe’s idea that “a large poem is, in fact, merely a succession of brief ones – that is to say, of brief poetical effects”. Even so, Ravel was not averse to working on the large scale. His two operas, L’heure espagnole and L’enfant et les sortilèges, are very successful, as are orchestral works like the two piano concertos, Daphnis et Chloé and the ubiquitous Boléro. Ravel was, moreover, a highly skilled orchestrator, both of his own music (Ma Mère l’Oye, Valses nobles et sentimentales, both originally for piano) and others (Musorgsky’s Pictures at an Exhibition). His mélodies, too, are models of their kind and include masterpieces like Shéhérazade, Histoires naturelles and Trois Poèmes de Stéphane Mallarmé. The solo piano music is outstanding, with works such as the Pavane pour une infante défunte, ‘Alborada del gracioso’ from Miroirs, Gaspard de la nuit and Le tombeau de Couperin having become an indispensable part of the piano repertoire. It is, however, the chamber music that interests us here, and Ravel has furnished us with some superb examples of his artistry in the form. Apart from the works on the present disc there are the String Quartet in F, the Introduction and allegro for harp, flute, clarinet and string quartet, a fine Piano Trio and the gorgeous Berceuse sur le nom de Gabriel Fauré. This recital opens with Ravel’s last foray into the Hungarian gypsy idiom, Tzigane (Track 1). written in 1924 for the Hungarian violinist Jelly D’Aranyi, this work was originally scored for violin and piano but subsequently arranged by the composer for violin and orchestra.It is essentially a Hungarian rhapsody divided into two sections. The first forms a lengthy cadenza for the violin alone, in which thematic material to be used in the main body of the work is introduced. Highly declamatory and recitative-like, the cadenza also features numerous technical hurdles including multiple-stopping and rapid cross-string bowing and passage-work. The second section, in which the piano accompaniment makes its appearance, utilises the variation technique so typical of this genre to build excitement while introducing more demanding techniques, not least stratospheric harmonics that require absolute accuracy and a delicate touch, and left-hand pizzicato, to further bedevil the violinist. The Sonata for Violin and Piano (Tracks 2–4), written between 1923 and 1927, is really Ravel’s second if one counts the one-movement student work of 1897 (which remained unpublished until 1975, Ravel’s centennial year). Comprising three movements, it is rich in borrowed idioms yet largely spare in texture. The opening Allegretto (Track 2), in standard sonata form, is for the most part flowing and melodically attractive, its typically French flavour holding no intimation at all of what is to come. In much the same way as Ravel’s Gmajor Piano Concerto was influenced by jazz and blues, so, too, does the second movement ‘Blues (Moderato)’ (Track 3) reflect the influence of American music, especially Gershwin’s. Swinging rhythms and strummed chords on the violin, as well as bitonal passages, make this a movement full of interest. force in terms of a “mechanised” style of writing, the driving semiquavers not, however, dispelling an overall feel of lightness and elegance. The sonata was written for the violinist Hélène Jourdan-Morhange, who was afflicted with arthritis by the time of its completion and consequently unable to perform it. None other than the Romanian violinist and composer Georges Enescu gave the premiere performance in the Salle Erard, Paris, on 30 May 1927, accompanied at the piano by Ravel himself. Pièce en forme de Habañera (Track 5) was originally written as a vocal study, the Vocalise-étude en forme de Habañera, and was commissioned by a professor of voice at the Paris Conservatoire, A.L. Hettich. It features a gorgeous melody over a typical Habañera rhythm, in this case duple time with a characteristic dotted quaver on the first beat. Ravel later transcribed the piece for cello and piano, but further transcriptions by others for numerous instruments, including English horn, saxophone and clarinet soon followed. The most enduringly popular choice has, however, been the violin, with such luminaries of that instrument as Misha Elman and Joseph Szigeti making their own versions. Also originally conceived for voice but often played as instrumental pieces, are the Deux Mélodies hébraïques, written between 1914 and 1919 (Tracks 6&7). The first song, ‘Kaddisch’ (Track 6), is a setting of the Jewish Doxology which sanctifies God’s name in both Hebrew and Aramaic and features a highly melismatic, chant-like melody; arpeggiated chords in the rather sparse piano part imitate a harp. By contrast, ‘L’Énigme éternelle’ (Track 7) is a straightforward setting of a simple folk-like melody which, together with the puzzling text in Yiddish (“The world asks the old question, tra la la; men reply tra la la...”), was first published by the Society for Jewish Folk Music in Russia in 1911. These songs in their original form are examples of Ravel’s interest in the songs of other nationalities, like the Cinq Mélodies populaires grecques and the Chants populaires, which contains the popular ‘Chanson hébraïque’. One work which Hélène Jourdan-Morhange did get to premiere was the Sonata for Violin and Cello (Tracks 8–11). Written between 1920 and 1922 and dedicated to the memory of Debussy, this extraordinary work sees Ravel seizing fully the rigours of counterpoint and linear writing while foregoing harmony in the strict sense. Given the resulting starkness, it comes as no surprise that Ravel once referred to this sonata as a “machine”. The influences of Bartók and Stravinsky are apparent in the spare textures and the angularity of the melodic writing. Throughout the course of the four movements, two main themes are contrasted and developed: the first, an arpeggio-like theme making use of major and minor thirds, lends itself readily to an accompaniment-like role (as in the second movement), while the second theme, making use of sevenths, provides the ideal structural foil, both in vertical and horizontal terms. Also present are polychordal passages and hints of the bitonality that was to become more evident in the Sonata for Violin and Piano.